The junior varsity Flyers won their league title. 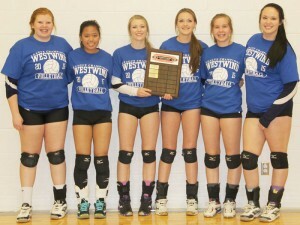 From left: Cassidy Nathe, Eula Mengullo, Janelle Stockton, Abby Bourassa, Danielle Hedley and Mackenzie Hearn. 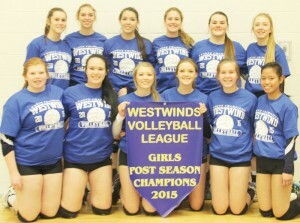 Westwinds Volleyball League post-season tournament champion F.P. Walshe Flyers. Back row, from left: Shelby Lyke, Jamie Brown, Brooklyn Bourassa, Emily Eremenko, Brooke Pansky and Andie Curran. Front row, from left: Cassidy Nathe, Mackenzie Hearn, Janelle Stockton, Abby Bourassa, Danielle Hedley and Eula Mengullo. Led by league MVP Jamie Brown and all-stars Emily Eremenko, Brooklyn Bourassa and Andie Curran, the F.P. 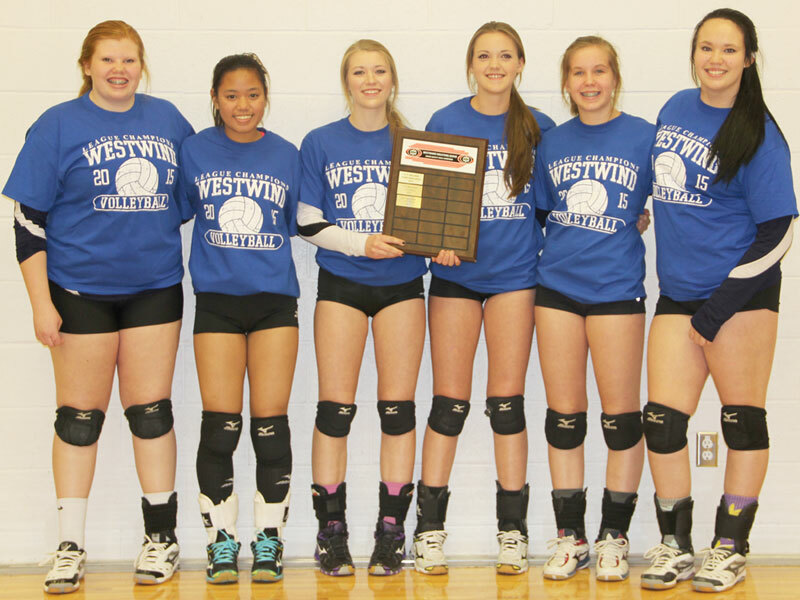 Walshe Flyers claimed the Westwinds Volleyball League playoff title Saturday. 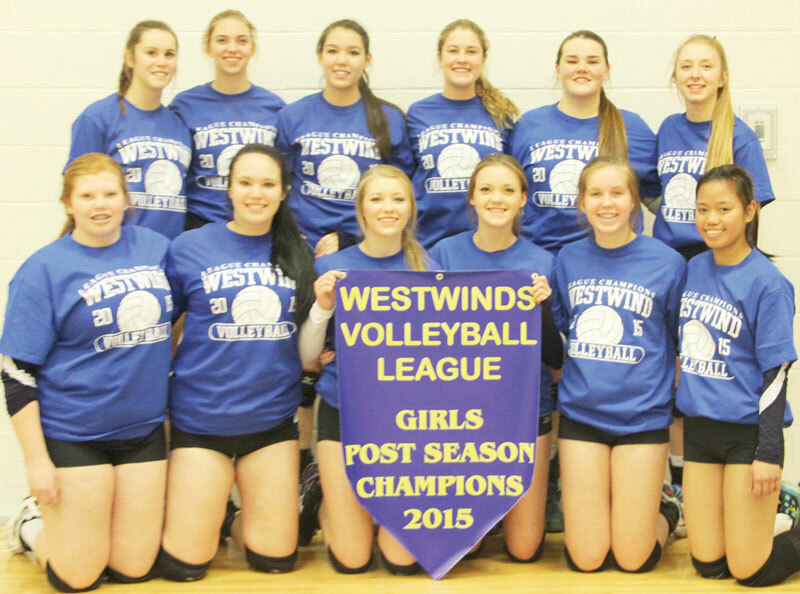 The Flyers won three straight matches Saturday at Willow Creek Composite in Claresholm to add the high school playoff crown to their regular season championship. The junior varsity Flyers, who went 30-0 in regular season, added their league championship to the banner haul. F.P. Walshe opened the playoff tournament Saturday afternoon against Noble Central Blades from Nobleford. The Flyers swept the match in straight sets by scores of 25-11, 25-20 and 25-16. That advanced the Flyers to a semifinal match against J.T. Foster Raiders from Nanton. The Flyers won the first set 25-16 but the Raiders, who handed F.P. Walshe a rare loss during regular season, rallied to even the match with a 25-22 win. The Flyers came from behind to win the third set 25-21 and then clinched a berth in the championship with a decisive 25-14 win in the fourth set. 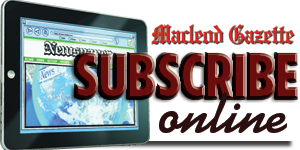 Waiting for the Flyers in the tournament championship was host Willow Creek Cobras, who had advanced to the final by knocking off Crowsnest Pass Pandas. The Cobras stung the Flyers 25-21 in the first set. That loss seemed to wake up the Flyers, who responded with 25-12 wins in the next two sets. With the championship in reach, the Flyers claimed the title with a 25-19 victory in the fourth set. The Flyers begin their quest for a 2A south zone championship Thursday, Nov. 12 at Lethbrdige College. Ranked No. 1 going into the tournament, the Flyers open round-robin with a 5:30 p.m. game against No. 7 County Central Hawks from Vulcan. The Flyers are back on the court at 7:30 p.m. Thursday to take on Kate Andrews Pride from Coaldale, who are seeded third. On Friday, Nov. 13 the Flyers take on Picture Butte Queens, who are ranked No. 5 in the zone, at 4:30 p.m. The Flyers close out round-robin at 10 a.m. Saturday, Nov. 14 when they take on the ninth seed. Playoffs begin at 12 noon Saturday, with the 2A gold and bronze medal games starting at 6:30 p.m.